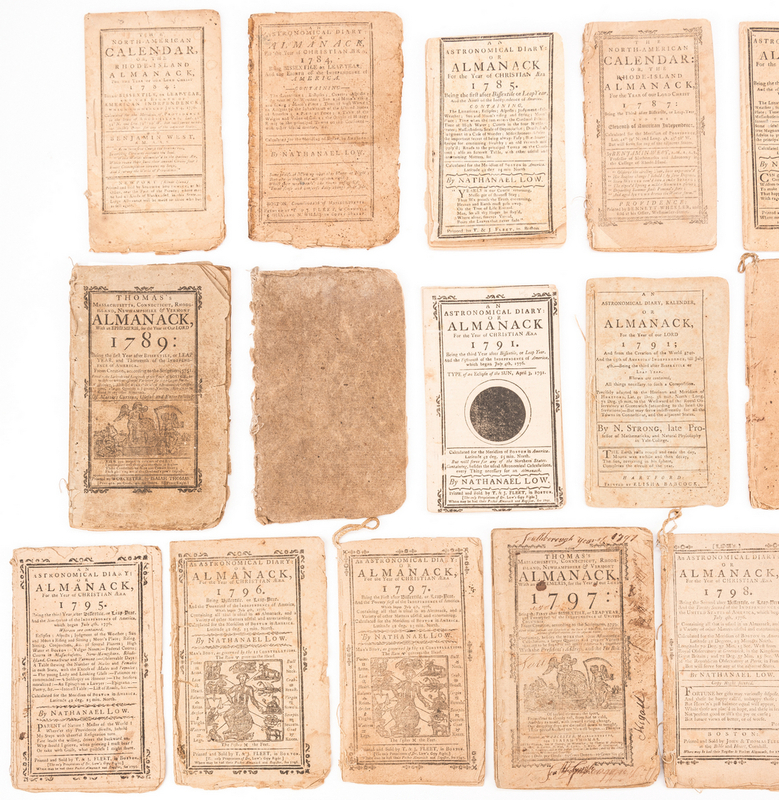 Nineteen (19) Post Revolutionary War Almanacks, including Thomas, West, and Low. Octavos, self wrappers, stitched, approx. 22-24 double sided pages. 1st-3rd items: "Thomas's Massachusetts, Connecticut, Rhode-Island, New Hampshire & Vermont Almanack, With an Ephemeris, for the Year(s) of Our Lord 1788, 1789, and 1797", printed by Isaiah Thomas (1749-1831), Worcester. 1788 edition features "Proceedings of the Federal Convention" with one of the earliest printings of the Constitution of the United States, followed by George Washingtons signature in typeset. 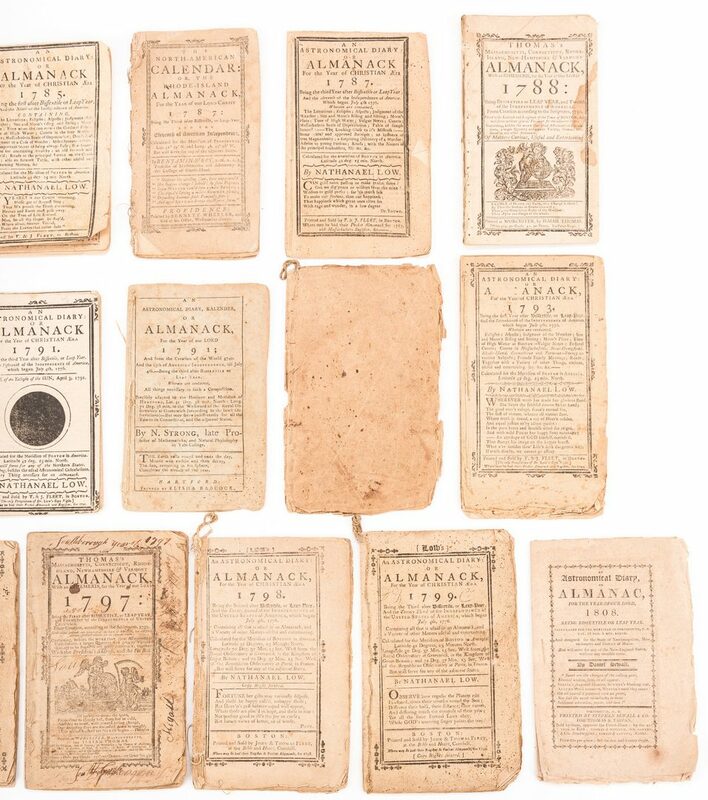 "Thomas's Massachusetts, Connecticut, Rhode-Island, New Hampshire & Vermont Almanack, With an Ephemeris, for the Year of Our Lord 1789", printed by Isaiah Thomas (1749-1831), Worcester. 1789 edition includes documentation of the "Transit of Mercury over the Sun's Disk; vi(s)ible to all the inhabitants of the United States, on the 5th of November, 1789", with "Explanation of the Plate" and accompanying woodcut engraving. Also includes woodcut engraving of "The Anatomy of Man's Body, as governed by the twelve Constellations, viz." on following page. 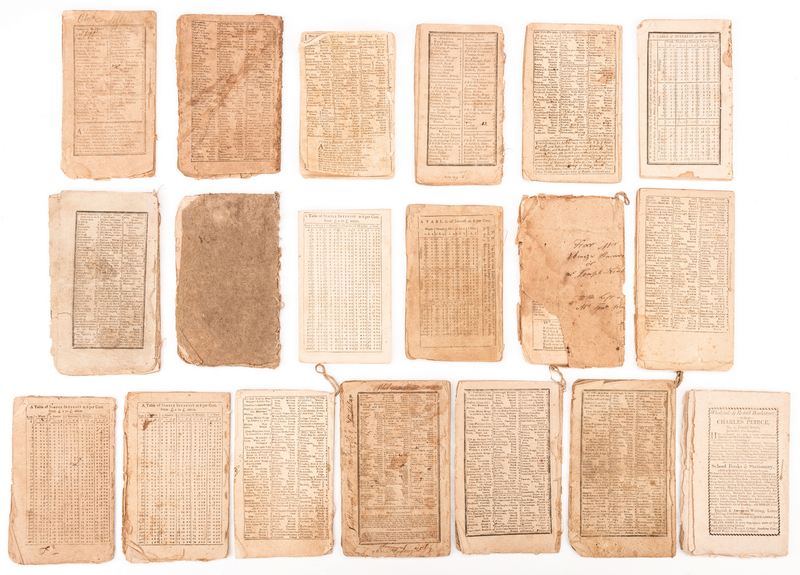 All editions with engraved woodcuts corresponding to calendar months. 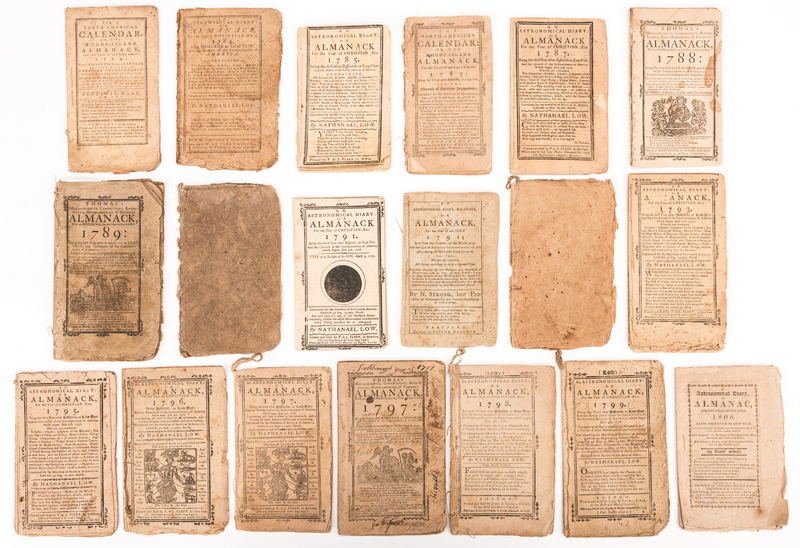 Almanacks range in size from 7" H x 4" W to 7 3/4" H x 4 5/8" W. 4th-5th items: "The North-American Calendar, or, The Rhode-Island Almanack, For the Year(s) of Our Lord Christ 1784 and 1787" by Benjamin West (1730-1813), printed and (s)old by Solomon Southwick, Newport, 1784 edition, printed and (s)old by Bennett Wheeler, Providence, 1787 edition. 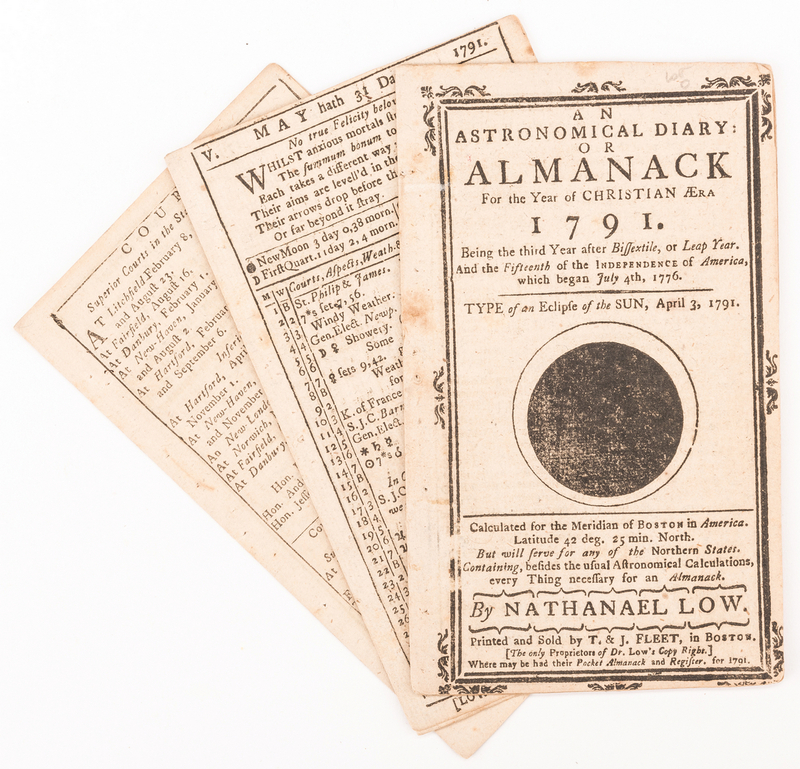 1787 edition includes three-and-a-half page account of the discovery of the planet Herschel (Uranus) with woodcut engraving of lunar eclipse on second page. 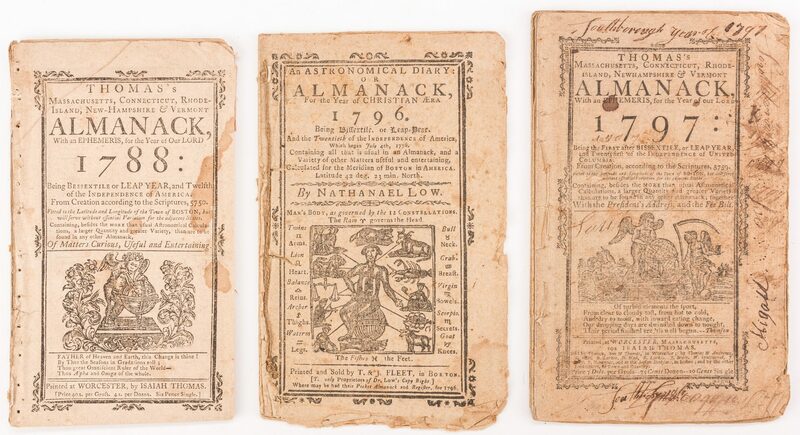 Almanacks range in size from 6 7/8" H x 3 7/8" W to 7 1/4" H x 4" W. 6th-17th items: "An Astronomical Diary: or Almanack, for the Year of Christian Aera, 1784" by Dr. Nathanael Low (1740-1808), printed by Thomas and John Fleet, Boston. 1784 edition includes five page "Address To the inhabitants of the United States of America…" in which the author (Low) discusses the recent end to the American Revolutionary War and "…wi(s)hes health, peace, and pro(s)perity in this life, and con(s)ummate felicity in the life to come, forever" to his readers, dated September 30, 1783. 1795 edition includes a census of males and females per each state (16) with a column for "exce(s)s". 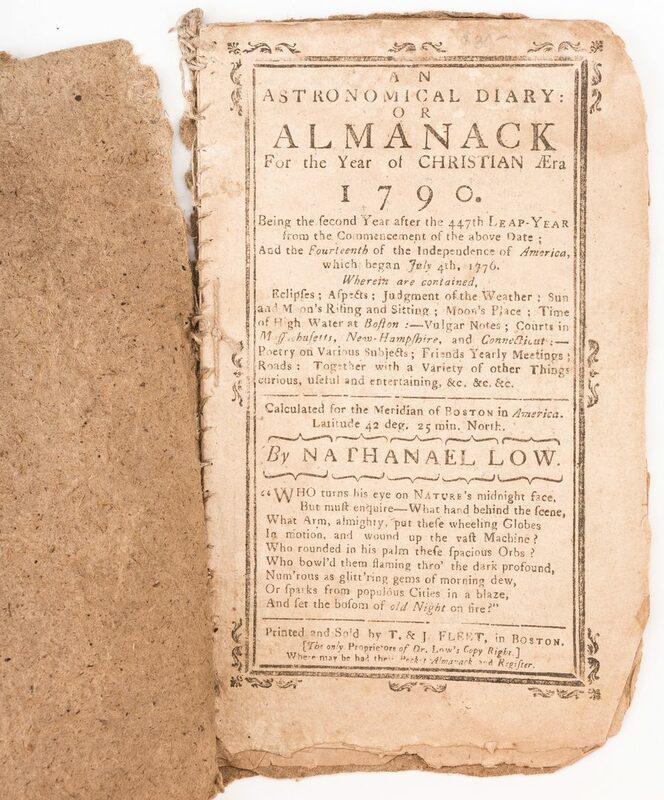 6 1/4" H x 4" W to 7 3/4" H x 4 1/2" W. 18th item: "An Astronomical Diary, Kalender, or Almanack, For the Year of Our Lord, 1791" by Nehemiah Strong (1729-1807), printed by Elisha Babcock, Hartford. Includes the "Story of General Putnam and the Wolf" with accompanying woodcut engraving. 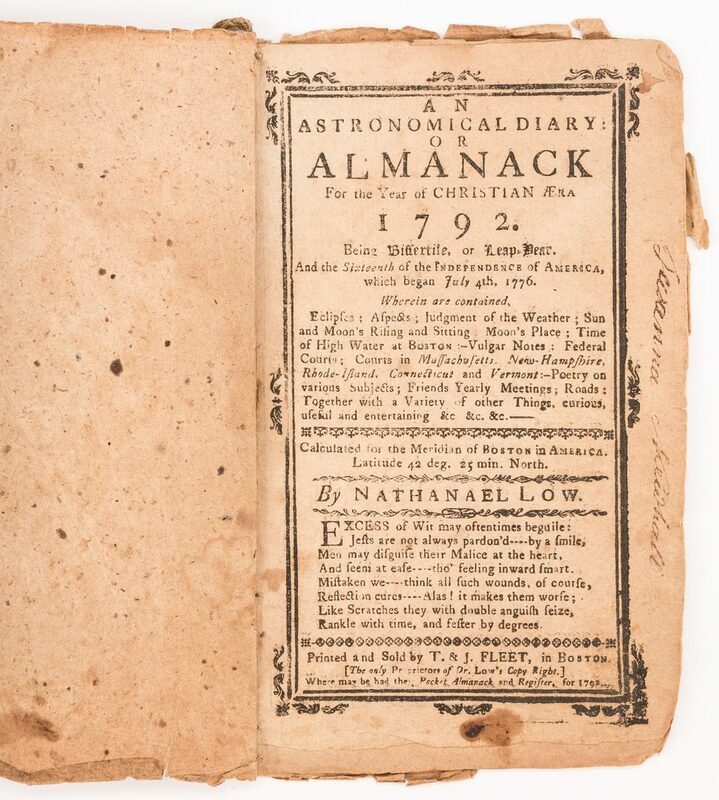 6 5/8" H x 4 1/8" W. 19th item: "An Astronomical Diary, or Almanac, For the Year of Our Lord, 1808" by Daniel Sewall (1755-1842), printed by Stephen Sewall and Company, for Thomas and Tappan, Portsmouth. 7" H x 4 5/8" W. Provenance: Private Knoxville, TN collection. CONDITION: Overall good condition. Toning, dampstaining, foxing spots, personal inscriptions, ink spots, tears, to be expected from age. See following reports for condition of stitching. 1st-3rd items: Pages slightly uneven, 1789 edition. No stitching intact, 1788 edition. First three and last leaves mostly separated from binding, appears to have been previously glued to boards and removed, 1788 edition. Partial stitching intact 1 3/4" area, top, 1 1/2" area, middle, and 3/4" area, bottom of binding, 1789 edition. Stitching intact except at top of binding, 1797 edition. 4th-5th items: 1 3/4" area of stitching intact, middle of binding, 1784 edition. Partial stitching intact along binding, 1787 edition. 6th-17th items: Added front and back leaves, possibly made by bookseller, 1790 and 1791 editions. Added front leaf, possibly made by bookseller, 1798 edition. All stitching intact, 1787, 1792, 1793, 1796 edition. Stitching missing, old glue repair along length of binding, 1784 edition. 3 1/2" area of stitching intact, middle of binding, 1785 edition. All stitching intact, except on top half of added leaves, 1790 edition. No stitching intact, 1791 edition. Some interior pages unevenly cut, 1795 edition. Majority of stitching intact, 1 1/8" area missing, top of binding, 1795 edition. Stitching intact with cord loop at top of binding, 1797, 1798, and 1799 editions. 2 3/8" section of final leaf separated from top of binding, 1798 edition. 18th item: Stitching intact and in good condition. 19th item: 3/4" area of stitching intact, middle of binding.